General de Gaulle is no longer here but I would venture to say that his description of the French character still holds true. Yet, since his time, the world has become truly globalized – and many of the French have as well. Many young French people now flock to London or the Silicon Valley or Sweden or Japan to pursue their studies and some even end up making their lives outside of France. Others return to France. All speak very good English. That was certainly not the case in de Gaulle’s time. The American influence is all over Paris. Who ever would have thought the French would see food trucks on their streets? But they are there and everyone loves them. 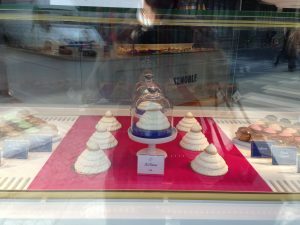 In traditional boulangeries, brownies comfortably nestle among the éclairs and millefeuilles. 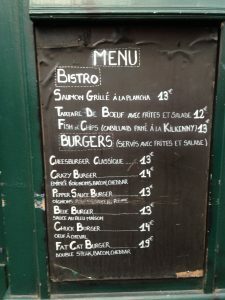 In French restaurants you’ll have no problem ordering a hamburger (pronounced hahm bourg air) or cheeseburger (see picture above). Some of the changes are welcome. The French are no longer universally rude, although the stereotype of that famous trait continues relentlessly. Just the other day, Pamela Druckerman wrote a column in The New York Times about taking French nationality. 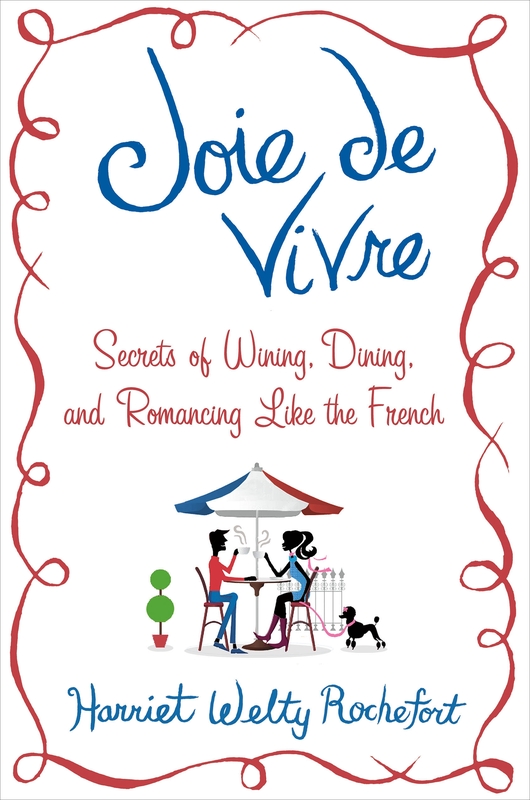 She remarked that a friend asked her “if she felt herself getting more and more rude.” I think it’s a great laugh line but am a bit worried about her friend and all those people who remain convinced that the French are, above all other things, rude. If you turned that comment around, it would be a bit like asking someone who had taken U.S. citizenship “if she felt herself getting fatter and fatter or louder and louder.”, Ouch. So, obviously, for some people, the French are still rude, while others find them friendlier and friendlier. It’s true, as I tell my students, that the French are sticklers for form and resent those who omit the proper ones. For example, if you walk up to a Frenchman while in Paris and ask him directions in English and without even saying “Bonjour“, you can bet he’ll be rude. In France, you preface requests and conversations with a “”Bonjour, Monsieur” or “Bonjour, Madame“. It simply means that the person is worthy of of respect and a human being (kind of our equivalent of “have a nice day”). To continue the list of changes, the French brush their teeth more, wear deodorant more, are less rude, speak more English. That’s the good side. They also are packing on the pounds due to the change in their diet which comes from our American influence. (Sorry). French kids used to eat bread for breakfast, now they consumer sugary cereals. Go to a grocery store and you’ll see a tremendous variety of snack foods and fizzy sugary soft drinks you never would have seen before. You also see people eating sandwiches in the metro. At the same time, and you might call this the French paradox, the interest in “bio” or organic foods has progressed by leaps and bounds and people are focusing more on vegetables and light food than heavy meat-based stews. Still, when I see ads for industrial sugar products on the tube with the warning message under it admonishing us all to “eat 5 fruits and vegetables a day” I see that the French have bought into the same mixed message we have in the States. (But that, I fear, is a worldwide phenomenon). What remains that is really, really French? Several times during the week, sometimes early in the morning, sometimes at mid-day, I see groups of children, sometimes as young as 3 years old, walking, two by two, in an orderly line, accompanied by adults. They are being taken to some activity, maybe the pool, maybe a film, maybe a museum. When they get to that museum, they don’t move or talk while the guide explains a work of art to them. That behavior has always fascinated me, as has the French childrens’ attitude to food. They eat – or try – everything. My grandchildren, from the time they could eat solids, have dug into (and dug) everything from smelly camembert and Roquefort to mussels. Why? There’s no concept of “food for children” and “food for adults”. It’s food for everyone! That’s one thing that I hope will NOT change in changing France. I’ve some photos to illustrate my various points. One is of an urinoir or “pissoir”, which still, unbelievably, exists in some cafés. They are going the way of the dodo – but not yet. 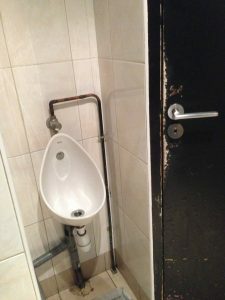 To me, it’s so macho because you have to make your way past the guy who’s peeing to get to the toilet for women. Beurkh. 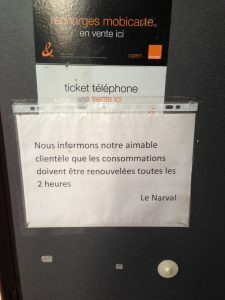 The other photo is of a sign in a café telling clients they are expected to renew their drinks order every two hours. This is aimed at all the people who remain in a café all day long sipping on one cup of coffee. Well, up until now that’s what people do in cafés! Seems to be changing and that would be too bad for the number of cafés has already plummeted drastically and a lot of people like this writer depend on cafés not just for the drinks but for the conviviality. But as I said, the French paradox reigns. Some of the French may be snacking while others stick to the traditional two main meal a day scheme. Some may feast on cheeseburgers and sandwiches while others prefer a good boeuf bourguignon. When I mentioned to a traditional French grandmother that her grandchildren could, from time to time, eat a sandwich without it killing them, she looked at me with horreur: “Mais ce n’est pas de la nourriture!” (But a sandwich isn’t food!”) she exclaimed. So there you have it. France is changing but not for everyone and not all the time and not everywhere. A complicated answer, perhaps, but the French are complicated. And that, I assure you, will never change. This entry was posted in Uncategorized on March 15, 2017 by harriet.welty. 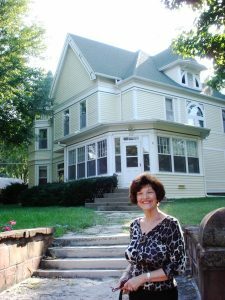 In today’s Joie de Vivre post, I’ll be talking not about France, but about America, and the joie de vivre I experienced growing up in an historic home n Shenandoah, Iowa. Built in 1895, it was and is beautiful and spacious, elegant on the outside with a wraparound enclosed porch and a turret, and on the inside with thick oak doors, a highly polished wooden staircase with newel post, stained glass windows and two living rooms, one upstairs, one downstairs, both with fireplaces. I associate the house with my “roots”: I am the sixth generation of the Welty family in Shenandoah which began with Samuel Welty in 1855. Most of our family lived on farms outside Shenandoah and my father was the first to buy a home “in town”. When he bought it in 1948 from the original owner, I was 3. I thought it was a family myth but my sister recently confirmed that the place was so big that on moving day I got lost! The house was the center of my universe. In fact, as I started thinking about our home on Center Street, I realised that I lived in the center of the country on Center Street, attended Central School (now unfortunately torn down), married a Frenchman who attended “Ecole Centrale” (also Central School) and whose family hailed from the Massif Central in the center of France. Plus, the house was central to my love of architecture and old homes and support of preservation efforts everywhere in the world. I have visited Shenandoah several times and have always gone to see the house – from the outside. Sometimes friends are surprised when I say that I never wish to go inside and that even if I were invited, I would not. Why? A house like that has a spirit of its own. It warmly wraps a family inside it. I will leave it to the present owners to enjoy their turn as custodians of this very special place. Even today, even after having lived in France for more years than I lived in the States, I can and often do take a mental tour of it, traveling from room to room. I remember the wallpaper in many of the rooms, the smell of the cedar closet off the upstairs living room, my cozy bedroom under the eaves, our family’s sit down dinners around the table in the dining room (where there was even a bell for servants in the floor under the table – no servants, though), the creepy basement and scary attic, the gatherings of friends around the grand piano, nights chatting lazily with friends on the front porch. The house is no longer “mine” but I carry its beauty and warmth wherever I go. This entry was posted in Uncategorized on March 6, 2017 by harriet.welty.